Alta Loma Elementary School teacher Jennifer Liebe-Zelazny is ready to strike if there's no deal come Monday, but she knows it will come at a cost to her fourth-grade students. Updated Saturday at 1:08 p.m. ET. "What does a labor union do?" "A labor union is an organization of workers that's formed for the purpose of benefiting the workers," she explains. They deal with "wages and benefits and working conditions." "Great," Jimenez continues, "and what is one thing they're able to do? It's that word — we wrote the definition down." "Strike," the class says in unison. Jimenez is teaching this lesson with an eye on the possible teacher strike in LA. With no negotiations planned for the weekend, a Monday strike is looking likely. United Teachers Los Angeles' more than 30,0000 members have been working without a contract for over a year. The LA Unified School District is the second largest school district in the country, and a strike would affect roughly 480,000 public school students. On Friday, the union once again met with district leaders to try to hammer out an agreement. Those negotiations came a day after California Gov. Gavin Newsom unveiled a proposed budget that included more funding for public education. After the Democratic governor's announcement, the district upped its offer. But on Friday, the union said it wasn't enough. It's still asking for smaller class sizes, and more nurses, librarians and counselors, among other things. The district says it can't afford to meet all the union's demands. Rosa Escobar and her daughter Kimberly are preparing to open their house to striking teachers on Monday. "We went to Costco today, so we have a big pack of toilet paper right there," Escobar said. In the event of a strike, the district says schools would remain open for the same hours, with the same before- and after-school programs. It has also said that student learning will still take place, with plans to staff schools with administrators, volunteers and 400 newly hired substitute teachers. 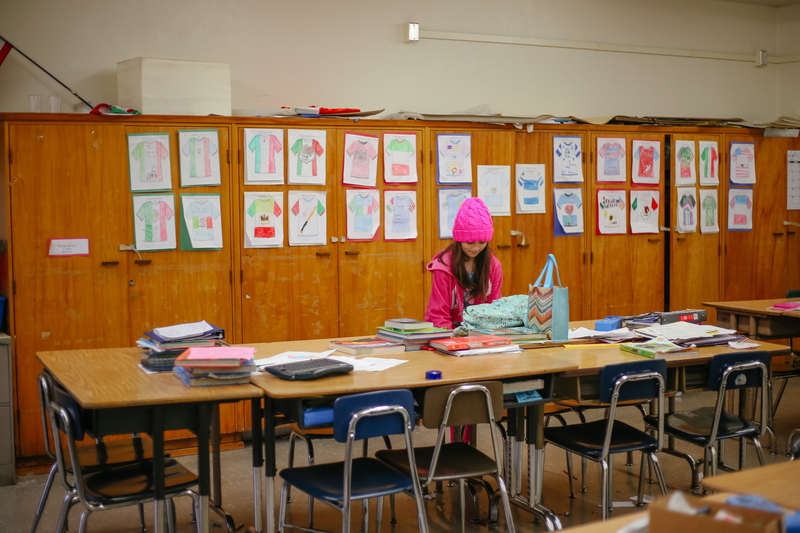 Principals are charged with creating plans for a school day — or several — without teachers, and it's unclear how many students would still attend classes. While some parents are still learning about the strike, others have taken to social media to show their support for teachers and organize sign-making parties. 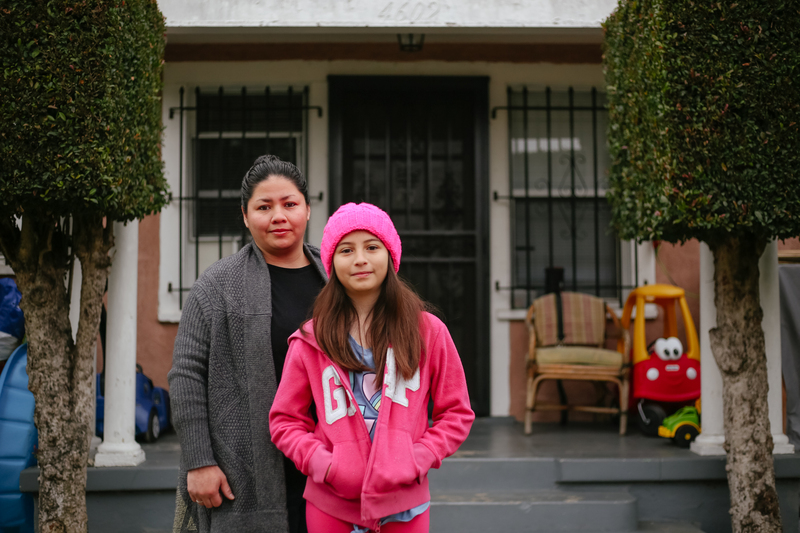 Parent Rosa Escobar has gone a step further: She's planning to open her house to striking teachers from nearby Alta Loma Elementary School, where her daughter is in fifth grade. "We went to Costco today, so we have a big pack of toilet paper right there," she said Thursday. Escobar isn't the only Alta Loma parent who has considered what they'd do if there's a strike. Mary Fuentes says it's important for her preschooler, Jennifer, to be in school, even if her teachers aren't, "because they learn more, and at home they don't do nothing." Leann White plans to keep her first-grade daughter, Saniya, home, but she understands parents who may not be able to make that choice. Kimberly Escobar, a fifth-grade student at Alta Loma Elementary School, understands her teacher may go on strike. "They're going to want to support the teachers, but they're going to have to send them to school because, 'If I don't send you to school how am I going to make the money to provide?' "
Alta Loma teacher Jennifer Liebe-Zelazny is ready to strike if there's no deal come Monday. But she knows it will come at a cost to her fourth-grade students. "I am obviously really concerned if this drags out what the real impact is gonna be to their progress," she says. "I'm a little stressed about that." Liebe-Zelazny has spent the last few days collecting donated books to send home with her students so they can have something to read during the strike. 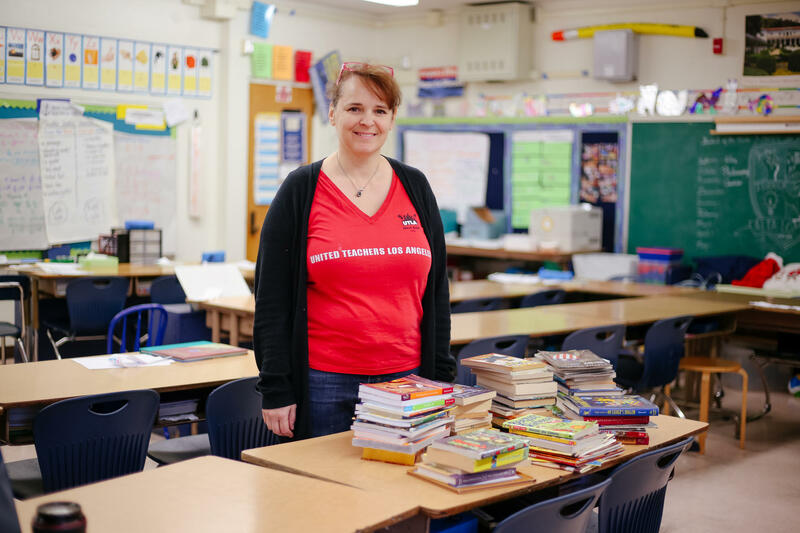 She says, "I'm trying to balance being a union member — and not wanting to make it any easier for the district — and being a teacher and a mom and wanting to give my kids everything." Los Angeles last saw a teacher strike nearly 30 years ago. Producer Lauren Migaki contributed to this report.